In a previous paper (6) the concept of frustration was analyzed and some doubt was thrown on its validity as ordinarily used. A sharp distinction must be made however between the frustrating situation and the subjective feeling of frustration. In this paper we shall be speaking about these subjective reactions of deprivation, frustration, conflict, or threat, except where it is specifically stated that the situation is meant. It was suggested that the concept included two completely different classes of psychological phenomena. One could be called sheer deprivation and it was maintained that its secondary effects were not ordinarily psychopathological. The second set of phenomena were labeled threatening frustrations and these were conceived to have the psychopathogenic effects ordinarily attributed to frustration in general. Thus the concept of psychological threat or threat to the basic needs of the organism was conceived to be more fundamental to any discussion of psychopathology than the concept of frustration. But it was indicated briefly in this paper that the concept of threat was not simply a sub classification of the head "frustration," but cross-cut this concept and included many more phenomena that have nothing to do with frustration. In the present paper I wish to discuss the concept of threat in connection with conflict phenomena as well and to give fuller description of the role dial threat to the organism plays in the abnormal personality. Since feelings of frustration and conflict are ordinarily conceived to be the main pathogenic mechanisms, any substitute for these concepts constitutes a new theory of psychopathogenesis. 1. Sheer choice. This is conflict in the simplest sense of all and would include such examples as a rat at a choice point in the maze. The daily life of every human being is filled with numberless choices of this sort. I would conceive the difference between this kind of choice and the next type to be discussed to be as follows: Type 1 involves a choice between two paths to the same goal, this goal being relatively unimportant for the organism, or else not being threatened at all. The psychological reaction to such a choice situation is practically never a pathological one. As a matter of fact, most often there is no feeling of conflict at all. 2. Choice between two paths to the same (vital, important) goal. In such a situation the goal itself is important for the organism but there are alternative ways of reaching this goal. The goal itself is not endangered. The importance or non-importance of the goal is, of course, a matter to be determined for each individual organism. What is important for one may not be for another. An example could be a woman trying to decide whether to wear one pair of shoes or another, one dress or another, to a party which happened to be important for her and at which she hoped to make a good impression. When the decision is made here the apparent feeling of conflict usually disappears. It is true, however, that such conflicts may become very intense as in a woman's choosing, not between two dresses, but between two possible husbands. We are reminded here of Rosenzweig's distinction between "need-persistent" effects and "threat" effects (9). 3. Threatening conflicts. This type of conflict is fundamentally different in kind from conflicts of the first two types. It is still a choice situation but now it is a choice between two different goals, both vitally necessary. Here a choice reaction usually does not settle the conflict since the decision means giving up something that is almost as necessary as what is chosen. Giving up a necessary goal or need-satisfaction is threatening, and even after the choice has been made, threat-effects persist. In a word, this sort of choice can eventuate only in chronic feelings of conflict and in chronic thwarting of a basic need. These are pathogenic. 4. Catastrophic conflict. This might better be called pure threat with no alternative or possibilities of choice. All the choices are equally catastrophic or threatening in their effects or else there is only one possibility and this is a catastrophic threat. Such a situation can be called a conflict situation only by an extension of the meaning of the word. This can be seen readily if we take the example of a man who is to be executed in a few minutes, or the animal who is forced in the direction of a decision which he knows to be a punishing one and in which all possibilities of escape, attack, or substitute behavior are cut off, as is the case in many experiments on animal "neuroses." Speaking from the point of view of psychopathology we must come to the same conclusion that we came to after our analysis of frustration. There are, in general, two types of conflict situations or conflict reactions, non-threatening and threatening. The non-threatening conflicts are quite unimportant, since they are not ordinarily pathogenic; the threatening types of conflict are important because they very often are padiogenic. At this point I wish to warn the reader not to read logical fallacies into these statements. Threat is not always pathogenic; there are normal healthy ways of handling it, as well as neurotic or psychotic solutions. Furthermore, an apparently threatening situation may or may not produce feelings of psychological threat in any particular individual. A bombardment or threat to life itself may not be as threatening as a sneer, a snub, the defection of a friend, an illness in one's child, or an act of injustice perpetrated against a total stranger a thousand miles away. But again, it would seem that when we speak about a feeling of conflict as an originator of symptoms we should do better to speak rather about threat or threatening conflict since there are types of conflict which do not create symptoms. We may then proceed to a reclassification of our concepts in the general field of psychopathogenesis. We may speak first of deprivation and, secondly, of choice and consider them both to be non-pathogenic and, therefore, unimportant concepts for the student of psychopathology. The one concept that is important is neither conflict nor frustration but the essential pathogenic characteristic of both-namely, threat of thwarting of the basic needs of the organism. But again it is necessary to point out that the concept of threat includes phenomena that are subsumed neither under the head of conflict nor frustration as, these words have been used1 in the past. Severe illness of certain types can be psychopathogenic. A person who has had a bad heart attack very frequently behaves in a threatened fashion. It is my impression that much illness in young children is directly threatening quite apart from the deprivations that are imposed thereby. Another kind of patient in which general threat has been demonstrated is the brain-injured patient as studied by Gelb, Goldstein, Scheerer (3,4), and others. The only way in which these patients can be ultimately understood is to assume that they feel threatened. It has been pointed out elsewhere (7) that all organic-psychotic patients of any type may be considered to feel basically threatened. In these patients the symptoms can be understood only if studied from two points of view-first, the direct effect on the organism of the damage to function or loss of function of whatever kind (loss effects), and, secondly, the dynamic reactions of the personality to these threatening losses (threat effect). From Kardiner's monograph on Traumatic neuroses (5) we find that we can add the effect of very basic and severe traumatization to our list of threat effects which are neither conflict nor frustration. According to Kardiner, these traumatic neuroses are the effect of a basic threat to the most basic executive functions of life itself-walking, talking, feeding, and the like. Again it must be pointed out that a traumatic situation is not the same as a feeling of traumatization, i.e., a traumatic situation may be psychologically threatening, but it doesn't have to be. The person who has gone through a very severe accident may conclude that he is not the master of his own fate and that death is ever at his door. In the face of such an overwhelmingly stronger and more threatening world some men seem to lose confidence in their own abilities, even the most simple ones. Other milder traumata will of course be less threatening. I would add that such a reaction is to be expected only in people with a certain kind of character structure which predisposes them to threat, for instance people who feel unsafe, or insecure or weak. The imminence of death for whatever reasons also may (but not necessarily) put us in a state of threat for the reason that we may lose our basic self-confidence here-when we can no longer handle the situation, when the world is too much for us, when we are not masters of our own fate, when we no longer have control over the world or over ourselves, certainly we may speak of feelings of threat. Other situations in which "there is nothing we can do about it" are also sometimes felt to be threatening. Perhaps severe pain should be added in this category. This is certainly something that we can do nothing about. Perhaps it is possible to extend the concept to include phenomena that are ordinarily included in a different category. For instance, we might speak of sudden intense stimulation, being dropped without foreknowledge, losing footing, sheer pain, anything unexplained or unfamiliar, the upset of routine or rhythm in the child as threatening to the child rather than as emotion-producing. We must of course also speak of the most nuclear aspects of threat, namely, the direct deprivation, or thwarting, or danger to the basic needs-humiliation, rejection, isolation, loss of prestige, loss of strength-these are all directly threatening. Often I have seen an extension of this threat effect to the defensive system of the individual. That is, we may expand the above statement to read "danger to the basic needs or the necessary conditions upon which they rest for the individual." If we had the space this would involve a discussion not only of specifically individual defense mechanisms, e.g., identifying keeping a job with masculinity, but also broader conditions like freedom to speak, to complain, to be ambitious, to move away, to determine one's own fate. We may summarize by saying that, in general, all the following are felt as threatening in our sense: danger of thwarting of the basic needs, or the conditions upon which they rest, threat to life itself, threat to the general integrity of the organism, threat to the integration of the organism, and threat to the organism's basic mastery of the world. Finally, it might be said that however we define threat, certainly there is one aspect which we must never neglect. Clearly an ultimate definition, no matter what else it might include, must certainly be related to the basic goals or needs of the organism. This means that any theory of psychopathogenesis in turn must rest directly upon theory of motivation. For this reason as well as for others the concept of threat and the theories arising there from must be considered to be dynamic in their nature. Dynamic theory as well as various empirical findings would indicate the necessity for individual definition of threat. That is, we must ultimately define a situation of threat in terms of the individual organism facing its particular problem. Thus, frustration and conflict both have very frequently been defined in terms of external situation alone rather than in terms of the organism's internal reactions to or perception of these external situations. Among the most persistent sinners in this respect have been some of the researchers with the so-called "animal neuroses." Still another important question of definition is involved here. How shall we know when any particular situation is perceived by the organism as a threat? For die human being, this can easily enough be determined by any technique which is adequate to describe the total personality, for instance, the psychoanalytic technique. Such techniques allow us to know what the person needs, what he is missing, and what endangers him. But for animals, the situation is more difficult. Here we become involved in circular definition. We know a situation is threatening when the animal responds with symptoms of threat. That is, the situation is defined in terms of responses and the responses are defined in terms of the situations. Circular definition is ordinarily not held in good repute, but we shall have to learn that along with a generally dynamic psychology must go an increase in respectability of the so-called circular definition. In any case, for practical laboratory work this is certainly not an insuperable obstacle. A last point which would certainly follow from dynamic theory is that we must always consider the feeling of threat to be in itself a dynamic stimulation to other reactions. No picture of threat is complete in any organism unless we know also what this threat-feeling leads to, what it makes the individual do, how the organism reacts to the threat. Certainly in the theory of neuroses it is absolutely necessary to understand both the nature of the feeling of threat and also the reaction of the organism to this feeling. An analysis of the work on behavior disturbances in animals indicates that it is ordinarily conceived in external or situational rather than in dynamic terms. It is the old mistake of considering that control of the psychological situation is achieved when the external experimental set-up or situation is made constant. (See for instance the emotion experiments of ten or fifteen years ago.) Ultimately, of course, only that is psychologically important which the organism perceives or reacts to, or by which it is affected in one way or another. This fact, as well as the fact that every organism is different from every other, must be recognized not just verbally, but also as it influences the set-up of our experiments and the conclusions drawn there from. For instance, Pavlov (8) has shown that the basic physiological temperament of the animal must be of a certain kind or the external "conflict situation" will not produce any internal conflict. And, of course, we are interested not in conflict situations, but only in feelings of conflict in the organism. We must recognize also that the unique history of the individual animal will produce varying individual reactions to a given external situation. We have been shown by the work with white rats that in some cases a peculiarity of the organism is all-important in determining the presence or absence of breakdown to identical external situations. Different species will have different resources with which to perceive, to react to, to be threatened or not threatened by an external situation. Certainly the concepts of conflict and; frustration are used loosely in many of these experiments. Furthermore, because of neglect of the individually defined character of threat to the organism certain differences in the reactions of various animals to an identical situation seem unexplainable. A better phrasing than those ordinarily used in the literature is that given by Scheerer of "requiring the animal to do something that he cannot do." This is a good concept because it does cover all the known animal work but we should make more explicit some of its implications. For instance, taking away from the animal things which are important for it may produce psychopathic effects of a kind similar to those produced by asking the organism to do something that it cannot do. In the human being the concept must include, in addition to, the factors mentioned, those of the threatening character of certain illnesses and certain damages to the integrity of the organism. In addition, we should explicitly recognize the factor of temperament which allows an animal to face a situation in which it is required to do something impossible and to which it responds in a non-psychopathic fashion simply by not caring about the situation, by being placid about it, or perhaps even by refusing to perceive it. Perhaps this sharper character can be achieved in part by adding to Scheerer's phrasing a statement of strong motivation, thus "Psychopathic reactions occur when the organism is faced with a task or situation which is impossible for it to solve or cope with, and which it wants very much to solve or which it must solve." Even this, of course, would still fall short because it would not include some of the phenomena that have been mentioned. However, it has the virtue of being a rather practical statement of the threat theory for laboratory purposes. Another point is that, because of neglecting to distinguish between nonthreatening choice situations and threatening ones in the animal and between non-threatening frustration situations and threatening ones, the behavior of the animal seems inconsistent. If the animal is conceived to be in a conflict situation at a choice point in the maze, then why does it not break down more often? If deprivation of food for 24 hours is conceived to be frustrating for the rat, then why does the animal not break down? Some change in phrasing or conceptualization is clearly necessary. One example of the neglect in differentiation is the failure to distinguish between a choice in which the animal gives up something and a choice in which the animal gives up nothing, one in which the goal remains constant and unthreatened but in which the animal has two or more paths to the same assured goal. If an animal is both thirsty and hungry then the animal would be more likely to feel threatened if it had to choose between food and water, getting either one or die other but not both. In a word, we must define the situation or stimulus not per se but as incorporated by the subject, animal or human-by its psychological meaning to the particular subject involved in the experiment, that is, dynamically. 1. ANDERSON, O. D., & PARMENTER, R. A. A long term study of the experimental neurosis in the sheep and dog. Psychosom. Med, Monogr., 1941, 2, Nos. 3 and 4. 2. BRITT, S. H., & JANUS, S. Q. Criteria of frustration. Psychol. Rev., 1940, 47, 451-469. 3. GOLDSTEIN, K. The organism. New York: American Book Co., 1939. 4. GOLDSTEIN, K., & SCHEERER, M. Abstract and concrete behavior: an experimental study with special tests. Psychol. Monogr., 1941, 53, No. 2. 5. KARDINER, A. The traumatic neuroses of war. New York: Hoeber, 1941. 6. 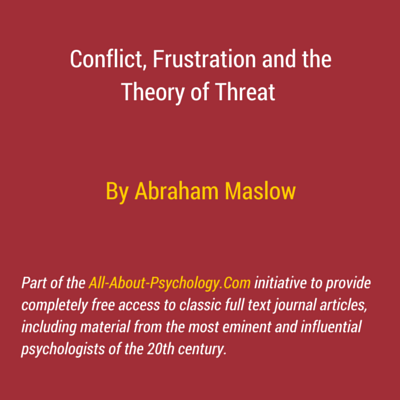 MASLOW, A. H. Deprivation, threat and frustration. Psychol. Rev., 1941, 48, 364-366. 7. MASLOW, A. H., & MITTELMANN, B. 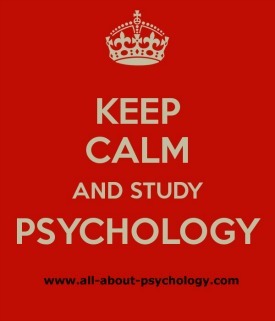 Principles of abnormal psychology. New York: Harper, 1941. 8. PAVLOV, I. P. Conditioned reflexes. London & New York: Oxford Univ. Press, 1927. 9. ROSENZWEIO, S. Need-persistive and ego-defensive reactions to frustration. Psychol. Rev., 1941, 48, 347-349.